Weren't illegal crossings declining anyways with all this chatter about immigration, etc. and folks being deported. With Dems trying to block Trump's policy's it spiked up again. Thus a need for the wall will always be there. Street drug dealers in the US. All the above benefit from an open border. I live on the border. I've lived on the border for decades. I used to cross it twice a day when I worked in a maquila. It's way more secure today than it was years ago. Tell me all about your own border experiences. The Yuma fencing (and that's how it is referred to in the article) was built in 2006. Check your calendars...it's 2018 now. Technology has taken giant leaps in the past 12 years. The iPhone for example (introduced in 2007). Don't need a wall. Or much more fencing. Security should be technology-based. A wall is a monument to the past; a monument to stupidity. I heard it was way down. They said that arrests for illegal crossings are down 46 percent in 2017. In December Homeland security said illegal crossings were down. See -- part of the problem -- different information to support different arguments. Do we believe Homeland Security on this ? They are at best guesses. If we knew every single person that came here illegally we could easily remove them but we don't. Census is useless for this. We must recall that the skeptics (including myself) did not believe Donald JOHN Trump for one moment when he proclaimed that Mexico would pay for the Wall. That was the promise he made over and over again to his chanting crowds. Most are for good border security, but most did not believe his nonsense that Mexico would pay for a wall. Of course, we must also recall that Mr. Trump has scaled back, to a markedly extent, how long said wall would be. He gave up on his 2,000 mile wall soon after being elected. So your concern is only for who's going to pay for it rather than the necessity of securing our southern border? Again, Trump never said that Mexico would write a check for the wall. He does however have a plan for them to reimburse us for it. Either way it's well needed. There is no need for a 2,000 mile long wall and Trump realizes that now. 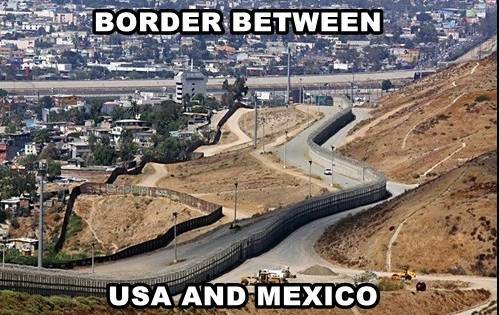 All that needs to be completed is the 700 mile long wall along the most porous areas of our border already approved by congress but no matter what you people will argue about who's going to pay for it and that it's too costly when your arguments have been debunked over and over.